Storeowners Juli Daoust and John Baker scout Scandinavia and Japan for the best designs in each region to bring back the best of their finds to their Toronto shop Mjölk (pronounced "mi-yelk"). We visited the duo in the city's Junction neighborhood for our September 2011 Design Finder. Here, they handpick their favorite items in the store and gives us a peek into why and how they chose each one. 1. 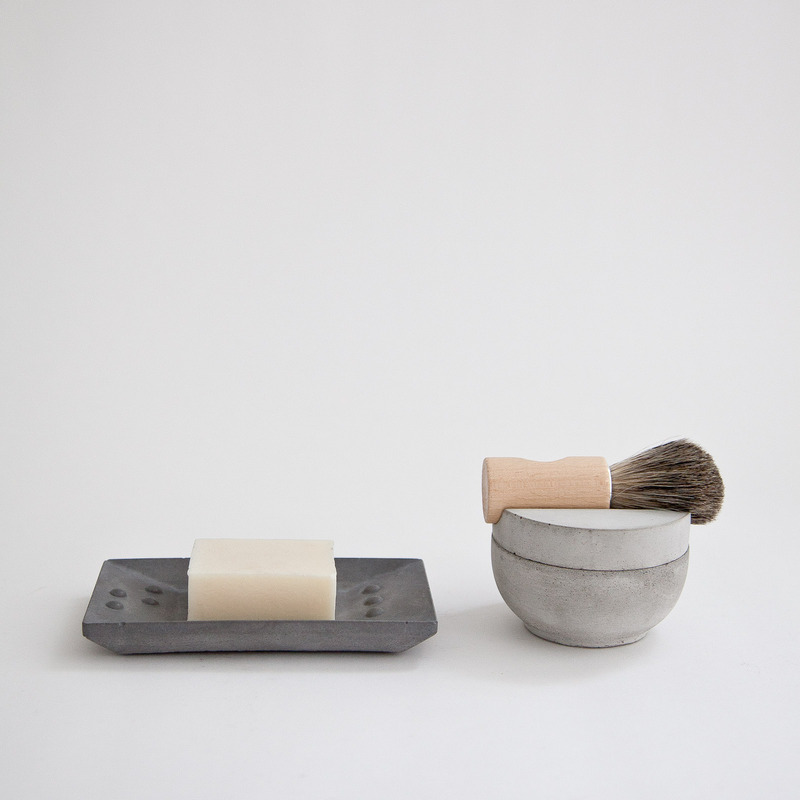 Concrete shaving kit by Lovisa Wattman for Iris Hantwerk. "There's something nice about taking time for yourself and the morning ritual of lathering up your traditional badger hair shaving brush, running hot water, and enjoying a good shave. This concrete set is made in Sweden and the brush is made by visually impaired craftspeople, the soap dish even says 'soap' in braille." 2. Brass pot stands by Oji Masanori for Futagami. "We love the idea of cooking a delicious meal and bringing all of your ovenware and cast iron to the table and serving dinner family-style. We can't think of anything more beautiful than these brass pot rests designed by Oji Masanori for time honored brass maker Futagami. Each are made of solid brass and are sand cast, leaving a beautiful texture that will begin to oxidize with age." 3. Business card cases by Masakage Tanno. "One of the first items we ordered for the store were these oak and walnut magnetic business card cases by master craftsman Masakage Tanno. We used them personally before the shop was even open and when someone asked us what kind of products we'd be carrying we'd pull out our wooden business card case and give them a card. We had the pleasure to visit Tanno in his studio in Asahikawa and are happy to announce a new range of products including a toothpick case and push mechanism pencil case. He also has a push mechanism business card case that is available in Japanese maple and ebony; the ebony will be exclusively offered at Mjölk." 4. Cheese planers by Thor Bjørklund. "A very nostalgic product indeed. We get dozens of people coming into the store and telling us they've been using their Bjørklund cheese planer for over 30 years. That doesn't surprise us though. Thor Bjørklund invented this iconic cheese planer in 1925, and it's been made in Lillehammer, Norway ever since." 5. f,l,o,w,e,r,s ruler by Studio Note. "The flower ruler is probably the most beautiful and poetic pieces we have in our shop. In the spring, the artist, Norihiko Terayama, picks flowers for the ruler, dries them, meticulously places them in one-centimeter increments and casts the flowers in acrylic. They are only available to order in the spring when the flowers are in bloom." 6. Kami mug by Oji Masanori. "The Kami cups are designed by Oji Masanori and made by an artisan named Hidetoshi Takahashi. We met him on a recent trip to Hokkaido, Japan, and it was amazing to see the process of how each cup was made. The cup itself acts as a natural insulator, keeping your hot drinks hot longer, which is perfect for us in the shop. It seems every time we pour ourselves a hot coffee we have to answer the phone or help a customer." 7. Glass carafe and kishu binchotan. "If you talked to us a couple years ago, we'd be the first to brag about how good Toronto tap water is. Since using our coal filter, we've really started to notice how much chlorine we were drinking, and how nice and clean tap water could taste. We have one of these mouth blown carafes at the shop and one at home. When people are looking for gifts this is one of our first recommendations." 8. Krummi hanger by Ingibjörg Hanna Bjarnadottir. "The Krummi is by Icelandic designer Ingibjörg Hanna Bjarnadottir. We have a couple of these in our bedroom, they're great for hanging up a sweater or displaying your newest piece of clothing, but they also look sculptural with nothing on them. In Iceland you can find these hanging in windows to keep birds from flying into them." 9. Kubus candleholder by Mogens Lassen. "One of our favorite Danish design pieces, it's timeless, mathematical, and looks good anywhere. For us it's a mark of approval when we see someone's home in a magazine and this candleholder is on their dining room table." 10. Laptop portfolio by Kenton Sorenson. "We own one of each of Kenton Sorensen's leather works. Each piece is made by Kenton himself in his studio in Wisconsin. His laptop case is particularly beautiful: when you open it up there is a place to hold a single pen, a notebook, and your laptop. As Kenton always says, 'The modern man travels light.'" 11. Iron scissors by Tajika Haruo. "When I first contacted Tajika scissors, they weren't sure about exporting their scissors to Canada. They asked their friend Oji Masanori if he had heard of our store, and lucky for us, we had just finished having his first exhibition in North America at our store. When Masanori told us this story we laughed; we had no idea there was ever a problem! The scissors have been made in Ono City, Japan, for four generations. We don't know what the rules are on wild flowers, but we use our flower shears every weekend to stop by the highway to pick daisies for the cottage." 12. Shoehorn by Nendo. "When we look for products, we have very strict criteria. We try to find our customers the best possible product with little or no in-store competition. The shoehorn by Nendo has to be the nicest shoehorn we've ever seen. It is made from a single piece of maple and held together by embedded magnets. At first glance the cone looks like a piece of art, but when people find out its function, their reactions are pure glee." Read our Q&A Design Finder article with Daoust and Baker from our September 2011 issue.